Can a woman resist beads? We took a short, local trip this past weekend and, as luck would have it, our route took us through Washington, NC, the home of A & A Beadery. I’d never been to the shop before, but had seen an ad for it in the local paper. It’s called A & A because the owners are Alice and Ann. I’m not sure which one I talked to, but she was sweet as pie. Seeing my purchase, she asked if I crochet and was genuinely interested in seeing any pieces I make. It’s an hour away, but I’ll definitely go back when my travels bring me that way. I love a shop that makes you feel welcome. Good for your husband being patient! That is great beautiful beads (yes, I spy the tomato!) I was thinking that maybe the motion of a woman going through little bead trays is not that much different than a man going through little screw, nails, or tool trays… yes? anyhow, they are all great! can’t wait to see what you crochet up with them!! My person favorite: definitely the ones in the bottom left corner. Absolutely gorgeous. Enjoy! 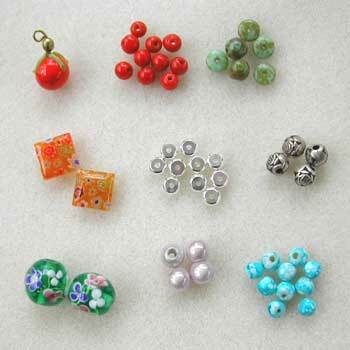 Pretty, pretty beads! I like the square ones…The tomato is hilarious! The beads are gorgeous!! I’m new to your blog and love it! Hi read your blog, don’t know if you still have it going. I am the new owner of A&A Beadery. The shop is now String of Pearls. We expanded our inventory, give classes etc. Hope you will stop when passing through.